Radiographic examination of the common bile duct after the administration of a radiopaque substance or medium. A written description of the cartilages. 1. To plan out dance movements to go with a piece of music. 2. To plan, coordinate, and supervise an event or activity. 3. To direct the development of a project; to orchestrate. Skilled and combined movements of dances which have been planned or performed. 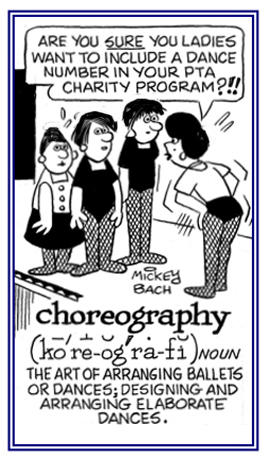 A person, or people, who perform movements; such as, dancers performing in a ballet or those who plan such movements. 1. A reference to the composition and arrangement of dances especially for ballet. 2. Characterized by the art of composing ballets and other dances and planning and arranging the movements, steps, and patterns of dancers. Someone who plans and produces dance presentations. 1. The work or skill of planning dance movements to accompany music: The art of designing the choreography for a ballet must be made in combination with the instrumental composition. Shirley has staged many successful ballets, so her skills when performing choreography has proven to be superb. 2. The steps and movements planned for a dance routine or a written record of them: The notation employed for choreography uses symbols just like music is represented by notes. 3. The carefully planned or executed organization of an event or the maneuvering of people or things: The choreography of the surprise birthday party for Mildred had to be well planned because there were so many different activities involved. © ALL rights are reserved. Someone who describes, or delineates, a particular country or district. The art or practice of describing, or of delineating on a map or chart, particular regions, or districts; as distinguished from geography, taken as dealing with the earth in general, and (less distinctly) from topography, which deals with particular places, as towns, etc. 1. A method of finding out which components a gaseous or liquid mixture contains that involves passing it through or over something that absorbs the different components at different rates. The mixture of materials to be separated is percolated through a column or sheet of some suitable chosen absorbent (for example, an ion-exchange material); the substances least absorbed are least retarded and emerge the earliest; those more strongly absorbed emerge later. 2. The separation of chemical substances and particles (originally plant pigments and other highly colored compounds) by differential movement through a two-phase system. A picture in colors from wooden blocks. Showing page 17 out of 92 pages of 1378 main-word entries or main-word-entry groups.